The Elder gives his thanks to Mario. 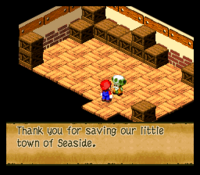 The Elder (or Real Elder) is the elder of Seaside Town in Super Mario RPG: Legend of the Seven Stars. He is the most respected person of said town. After Mario defeats Johnny at the Sunken Ship, he discovers that the Elder and other residents of Seaside Town are being held hostage at the Shed by Yaridovich and his underlings. Yaridovich demands that Mario hand over the Star Piece, and if he declines, they will "tickle" the Elder. In the end, Mario gives in. After the Shed has been opened with a Shed Key, the Elder will award Mario with a gift inversely proportional to the number of times he was tickled (meaning the more times he was tortured by Yaridovich, the lesser the value of the gift). After being freed, the Elder and the villagers return to their homes. This page was last edited on November 16, 2017, at 21:01.